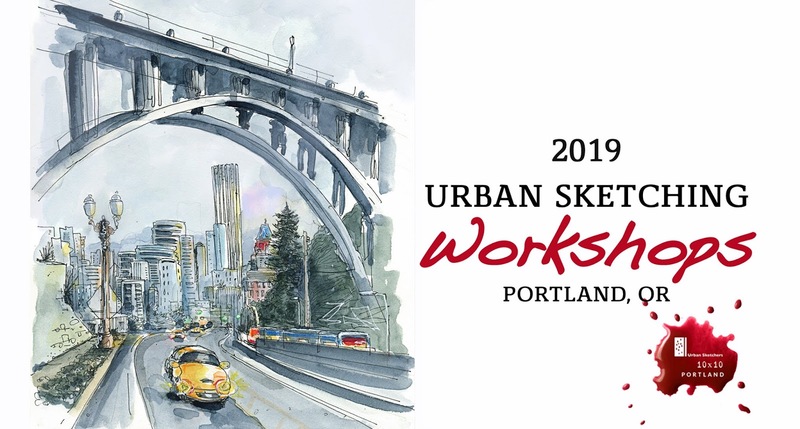 Urban Sketching workshops provide educational opportunities for current and aspiring urban sketchers, using Portland's sites and culture as our inspiration and playground. The program is designed in collaboration with the international Urban Sketchers organization and takes place in different cities around the world. Description: In this workshop urban sketcher and architect James Roberts will patiently walk you through the steps of setting up your drawing to adhere to the rules of perspective. Students will work from thumbnail sketches to one point perspective layout to final sketch. Description: In this workshop we will apply rules of perspective to drawing real city scenes. The instructor will lead you through a step-by-step process of drawing a busy street that is lined with buildings, urban furniture, cars, trees, and other objects that all have to align to a perspective grid to look real. We will look at techniques that allow for realistic portrayal of depth, glass, concrete, and other materials and textures present in urban settings. Description: We all love sketches that are not only beautiful to look at but also tell a compelling story. How do you infuse your sketch with meaning that is intuitively and universally understood? This workshop will introduce you to the key ingredients of a visual story and teach you easy to follow recipes to put together one of your own, when your time is limited. We will discuss key techniques that make your story easy to represent and follow. Finally we will put all of our ingredients together, selectively applying such techniques as isolating, motion framing, captioning, zooming in creating a story about the market. Description: 360 view approach is perfect for locations with exciting views in all directions, whether you prefer a simple contour line drawing or sketch with attention to every detail. We will talk about how to get started, choosing a layout to make it all fit, creating focal points, and techniques to make all elements connect into one cohesive panoramic drawing. Participants will complete at least one drawing on location and leave with knowledge of how to apply this technique to any location. Description: Drawing busy city scenes, moving people, and crowds is one of the most exciting challenges for an urban sketcher. It doesn't have to be so daunting that we give up without even trying. In this workshop we will take all of the stress out of making dynamic drawings. Breaking up the moving body into simple shapes we will learn how to capture the spirit of a busy place without having to draw every individual human figure. Through a series of fun, fast moving exercises we will progress to making a sketch of a popular Alberta street fair. Description: Rivers, lakes, and bays make for a perfect urban setting on a warm summer day, but how do you capture this liquid perfection and everything that is reflected in it with mastery and ease? In this workshop we will enjoy a beautiful morning on the Willamette learning to how convincingly portray boats, buildings, and the sky itself when it is reflected off the water surface. Description: Trees are an important element of almost any urban setting. From the purely artistic point of view they filter light, create intricate textures, mark seasonal changes. Yet, drawing natural looking greenery could be challenging–some sketchers get lost trying to draw every single leaf, others struggle with drawing convincing canopy shapes. The instructor will demonstrate how to quickly capture different species of trees and how to use color to make sense of light and shadow to portray urban forests. Description: Urban sketching doesn't have to be limited to daytime hours. Night time brings changes to how we perceive color, lines, and shapes. The instructor will share options for night-time color palettes and talk about ways to observe and convey city scenes when obscured by darkness and illuminated by artificial light. Dusk hour start time will also allow us to capture gradual changes that diminishing light brings to urban landscape. Description: We will celebrate our last workshop of 2019 with a portrait party. In a fun relaxing setting of an afternoon tea party we will engage in the favorite activity of urban sketchers when they all get together and that is to draw each other with abandon. But first we will delve into facial proportion lessons, demos on how to mix colors for believable skin tone, and pro tips on making your portraits ooze with personality and likeness. Did we mention there will be desert? Workshops are designed for all levels of participants. Instructors will provide guidance and tips necessary to get started for beginner sketchers while more seasoned artists will be challenged to further their skills with a fun array of fast-paced subjects and themes. Reserve your spot with a few clicks and maximum convenience through Eventbrite. I am All In: March 10 is the last day to cancel to receive full refund. 50% refund before April 7, 2019. Pick and Choose 7: March 10 is the last day to cancel to receive full refund. 50% refund if canceled on the date of the your first workshop. Pick and Choose 5: March 10 is the last day to cancel to receive full refund. 50% refund if canceled on the date of the your first workshop. Pick and Choose 3: March 10 is the last day to cancel to receive full refund. 50% refund if canceled on the date of the your first workshop. Individual Workshops: At least 10 days ahead of your workshop. Yes, if you have purchased 5 and 10 workshops packages in the past you can register with 20% discount for any workshop or package. Please email urbansketcherspdx@gmail.com to obtain a discount code. Thanks so much, I emailed my registration for the two June workshops, and am mailing a check for $90 to Rita Sabler. I can't wait! !